Officer-involved shooting kills two in Chicago, including 55-year-old mother of five. 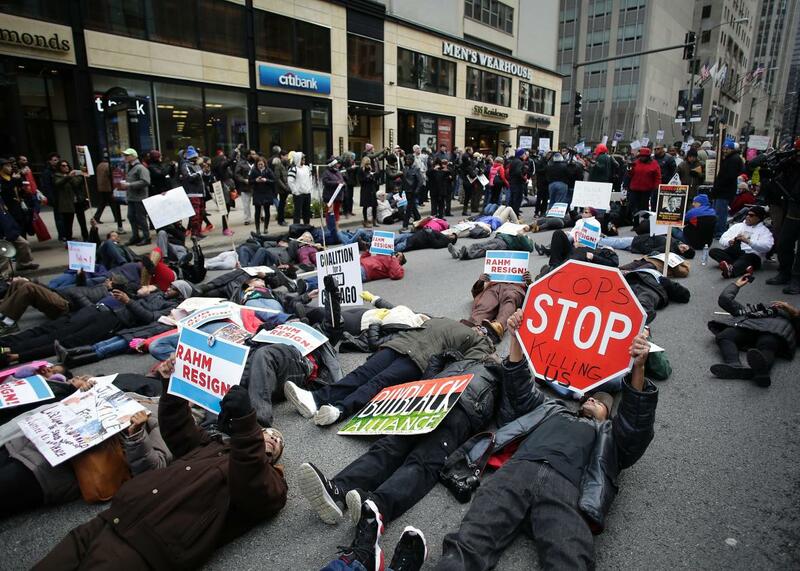 Demonstrators protest the fatal police shooting of Laquan McDonald as they attempt to disrupt holiday shoppers along Michigan Avenue on December 24, 2015 in Chicago, Illinois. Former Chicago police officer Jason Van Dyke, who was charged with murder last month in the shooting death of 17-year-old McDonald last year, was indicted on six counts of first-degree murder and one count of official misconduct earlier this month. A teenager and a woman were killed early morning Saturday in Chicago as police were answering a domestic disturbance call. The Cook County medical examiner identified the two people killed as 55-year-old Betty Jones, a mother of five, and 19-year-old Quientonio Legreir, reportedly an engineering student at Northern Illinois University. The Chicago Police Department issued a statement saying the shootings took place when officers were answering a call at around 4:30 a.m. “Upon arrival, officers were confronted by a combative subject resulting in the discharging of the officer’s weapon, fatally wounding two individuals,” the police said. Police were at the scene after LeGrier’s father called 911 because he was being threatened by his son with a metal baseball bat. LeGrier was shot seven times and pronounced dead at the scene, according to witnesses. LeGrier’s mother, Janet Cooksey, tells the Chicago Tribune that her son had been suffering from severe mood swings since September. “My son was going somewhere,” she said. “He wasn’t just a thug on the street.” Another family member confirmed this recent change in behavior. “I was praying with him, because he wasn’t acting like himself,” said Betty Turner, 56, LeGrier’s great-aunt. Witnesses say the woman who was killed lived in the building and had gone to answer the door for police. She was shot in the neck shortly afterward, according to NBC. Family members insist police shot at Jones from outside the building after she opened the door. Chicago’s Independent Police Review Authority confirmed the agency was investigating the incident but did not provide further details. This latest officer-involved shooting comes mere weeks after the Department of Justice announced it was launching an investigation to figure out whether the Chicago Police Department had systematically violated the civil rights of citizens due to its frequent use of force. And it took place two days after protests against the Chicago police shut down sections of a well-known shopping district in the city, notes CNN.